Analog Man carries the Voodoo Lab Ground Control Pro. The finest full-featured MIDI foot controller available. It is compatible with all MIDI controlled devices and provides the flexibility, ease-of-use, and rugged reliability necessary to meet the needs of the most demanding professional players. The Ground Control Pro is the finest full-featured MIDI foot controller available. It’s compatible with all MIDI controlled devices and provides the flexibility, ease-of-use, and rugged reliability necessary to meet the needs of the most demanding professional players. Imagine being able to instantly reconfigure your entire sound with the touch of a single button! With the addition of the GCX Guitar Audio Switcher you aren't even limited to MIDI devices, you can also control pedal effects, select amp channels, plus many other functions. 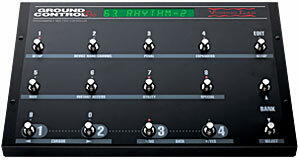 The Ground Control Pro allows you to simultaneously control up to 8 different devices, each on their own MIDI channel. It will also control up to four GCX Guitar Audio Switchers and our System Mix Plus stereo mixer. You can name each of your presets on the bright, stage-friendly alphanumeric display. And you can use volume or expression pedals to add real-time control of your sound with MIDI continuous controller messages. You can also assign 8 of its buttons for instant access of GCX loops and processor functions. This gives you stompbox style control over your processor or modeling amp’s internal effects. Comes with standard type 9V AC adaptor for USA voltage. These products are $499 each list, our price $399. We recommend buying both (GCX Guitar Audio Switcher).